Do you freeze up in a crisis? 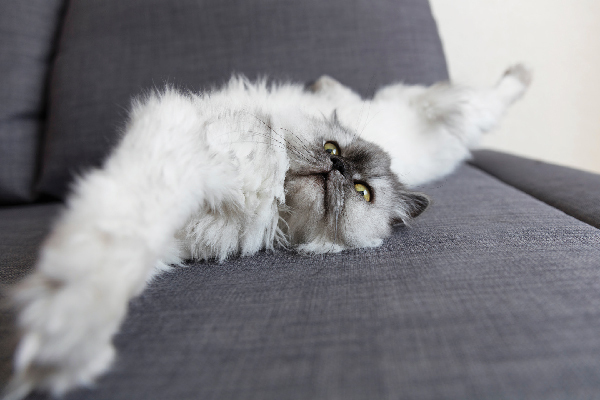 These tips can help you in the worst cat-emergency scenarios. I’ve been lucky in that I haven’t faced too many cat health emergencies where I had to act fast. I do not have the temperament of an EMT or first responder, and I tend to believe I would freeze up in a crisis rather than act appropriately. So I’m trying to think ahead. What if I had to react quickly? What if something went down really fast with my cat? Without getting into actual first-aid scenarios, there are simple things you can do to make an emergency scenario easier. Do these things now, before the emergency happens, and you’ll be grateful. 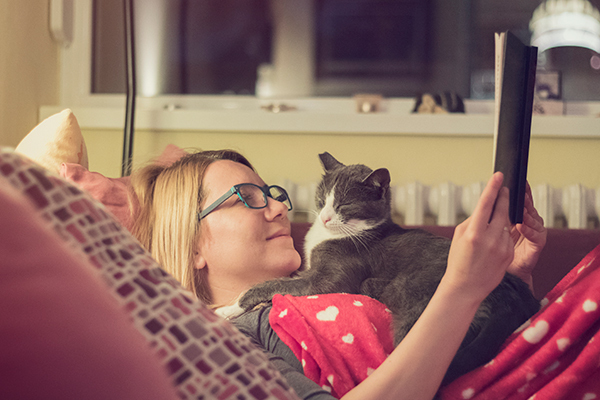 You’ll save time, hopefully be calmer during an emergency, and potentially help your cat. Guilty! 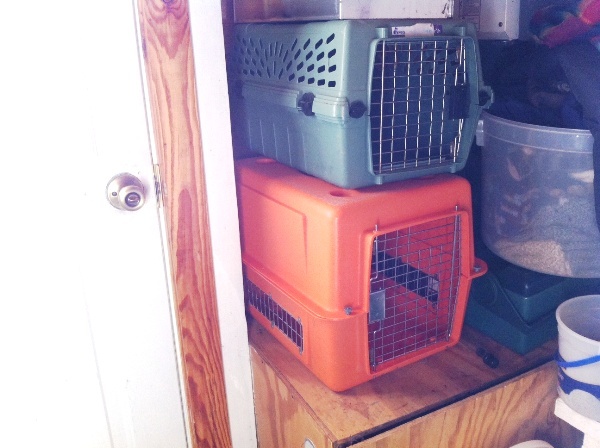 Can you believe our cat carriers used to be located in the back of the garage? That’s a terrible spot, especially if you’re in a hurry. (The carriers are now near our front door.) Stash those carriers near an exit, or someplace where you can get to them fast if you have to leave quickly with a cat. 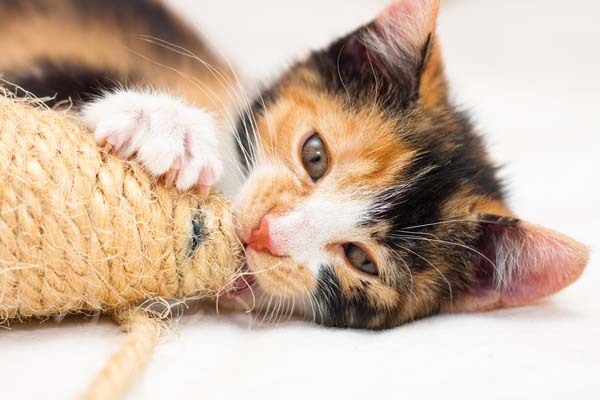 While you’re at it, ready the carriers with whatever you might put in them — blankets, fabric, something soft that smells like the household, so the cat will have a more comfortable ride. This could be overkill, but you might also have a bottle of soapy water and a few rags ready to go, too. I use an old water bottle with a twist-on cap. I’ve used this many time when I transport my cats, if they get sick along the way or have an accident in the carrier. Here’s another reminder that we’re never totally in control. What do you do if your car won’t start and you have to get to the vet right away? Is there a friend nearby who could help out? Are you near public transportation and do you know the schedules? 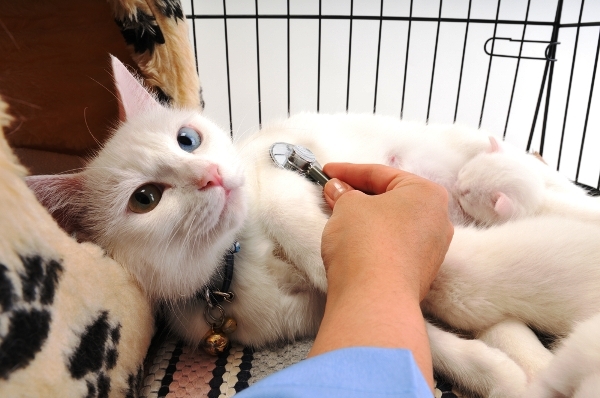 Does your vet make emergency house calls or is there an emergency vet in your area that does? If you’re unsure of the route to the vet’s office (maybe it’s a new vet that you’ve only visited once) get this clear in your head before an emergency. Some of you don’t have to worry about winter … and that’s a good thing. And some of us live in climates where it snows or freezes a lot. I don’t think there’s much that’s more stressful than driving with an ill (or healthy) cat in bad weather. I dread the thought of being stranded with an animal and would probably worry more about them than me. So be sure you are prepared if you have to travel in bad weather. Keep appropriate stuff in your car (chains, a shovel, blankets, etc.) and make sure that there’s a way for your cat as well as you to stay warm. It seems that some of our pet emergencies don’t follow a clock and strike when everything is closed. So find out ahead of time what your choices are. If your vet is on call during off-hours, make sure you know how to reach her, and program any needed numbers into your phone. If your vet does not offer these services, find out where the nearest emergency vet office is and make sure you know how to get there. Again, this is something I’ve never had happen. If you must act fast, I think it’s good for us to remember to try to stay calm in our movements. If we start freaking out, the cat may freak out more. If the cat freaks out and hides in some hard-to-get place, you’ll waste time and possibly stress your cat out more. Try to breathe and move deliberately and slowly. I remember having to tell myself this when Karma accidentally got outside. Because of her temperament, we knew we would lose her if we didn’t catch her. We forced ourselves to move slowly and not chase her (even though my body wanted to burst into action). We did catch her (barely), and I know that trying to stay calm helped the situation. Most of the experiences in my household with illness have developed slowly. But it’s good to anticipate emergencies. You might consider having sturdy gloves in an easy-to-grab place. 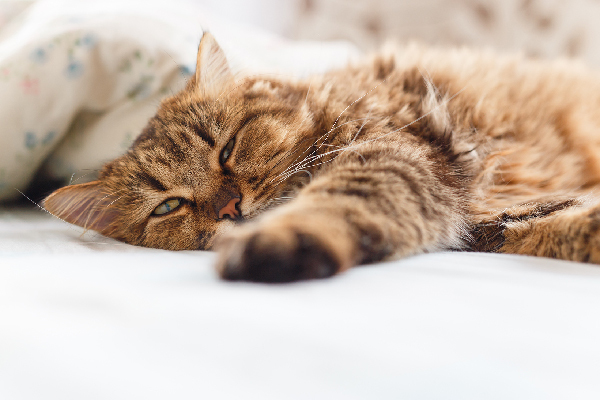 Do you have any tips on how to best respond to cat emergencies and how to be ready? Share your thoughts in comments.